The best feelings in life are the subtle ones. Joy is great in spurts, but imagine feeling joyous all the time. It'd get tiring. On the opposite end of the spectrum, imagine feeling grief for a prolonged period of time. You'd be in the hospital. The subtle feelings are ones are the ones that can last much longer and tend to have a stronger long-term influence on our thinking. For example, depression. A long term feeling of sadness. A lot can come from those feelings. Some things can be bad, but some things can be good like the urge to seek help. On the other side, feeling fulfillment and contentment are long term feelings of joy and absolutely symptoms of happiness. 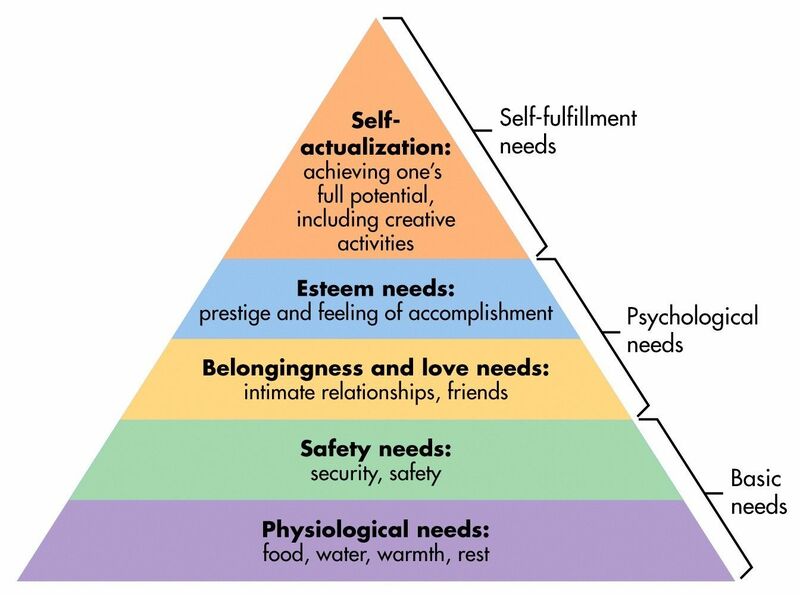 A feeling of fulfillment means you are meeting all your needs, according to Maslow. One way to achieve a sense of fulfillment (assuming the bottom four tiers are met and in modern society, they usually are), is to accomplish goals. To accomplish goals, the goals need to be set first. Simply put, having goals and working towards them will make you feel fulfilled. It's a feeling everyone knows: hard work paying off. What's interesting, though, is that achieving the goal is worth only about 35% of the satisfaction. The other 65% comes from the work that goes in to achieving it. Allow me to give you a real world example. Back in February, I signed up to take my province's engineering professional practice exam. This is an exam that, if passed, will allow me to become a professional engineer in the future and not end up like this guy. This is a tightly controlled exam. It involves studying professional ethics, the province's engineering laws, and other areas of the law that aren't really covered in depth in university courses. I had to make sacrifices to be able to pass, and I did. I studied for a minimum of one hour every day (average study time was an hour and a half) from February 26th to April 7th, the day before the exam. Let me tell you, it paid off. I left that exam feeling confident I did well. Breaking that down I made it a habit to set aside at least an hour every day to study. Towards the end of March, it felt natural. After work, I'd take a break to separate myself from my job, have dinner, and dive into studying. I wanted to keep that time block after the exam for writing. During March I was also working on a novella, and setting aside time every day to focus on my goal of passing the exam combined with the desire to finish writing the novella created a shift in my goals. I wanted to keep that time block to use for writing. Turned out to be a success because I finished writing my novella A Man Named Eustace by the end of April, and now I use that time block to work on other writing projects, including this blog. The point of that example is twofold: I enjoyed the habit of blocking off time with no distractions to focus on a goal (studying) that I ended up keeping it (for writing). Finishing the exam, while a great feeling, doesn't quite compare to the satisfaction I feel when I sit down and put my phone away to focus on writing. That's a universal truth, too. The habits you form while working towards a goal are equally, if not more, important than achieving the goal itself. It's all part of The Process. Another point I want to make about goals is that they're fluid. Well, not always. It depends on how you feel about them. You can set strictly rigid goals, but they work better in the short term than in the long term. This brings up another point about long term and short term goals. Both styles of goal are important. Long term goals give you a sense of direction, and short term goals give you something closer in sight to work towards, and the ability to develop new habits. Often times they can be linked. Finishing a novel can be a perfect short term goal if your long term goal is to win the Pulitzer Prize for Literature. Finishing a chapter can be a good short term goal for finishing your novel. They're all intertwined. Long term goals are more suitable to change than short term ones. If I changed my short term goal of studying every day for my exam, I probably wouldn't pass. If I change my goal of becoming an astronaut to becoming a writer (this is a real thing that happened to me) then the biggest thing that would happen is that I'd stop trying to plan how I'd meet these requirements and start focusing on spinning sentences, which is what happened. Now this all isn't to say that short term goals can't be changed either. They absolutely can. Nothing is ever set in stone, even if it's literally set in stone. Changing both long term and short term goals is okay because it reflects a change in interests, which is natural. The only bad things that can happen with your goals are if you don't set them and don't actively work towards them. Goals will force you to grow, and regularly meeting them is noted as being part of what makes people feel happiness/contentment/fulfillment which, for all intents and purposes, are essentially the same thing. Regardless of the goals you set for yourself, work towards them. You will see the difference in yourself as you gain new habits and learn new things. You'll also notice a growing sense of fulfillment in your life as you achieve things. What goals are you setting, and how do you plan to achieve them?